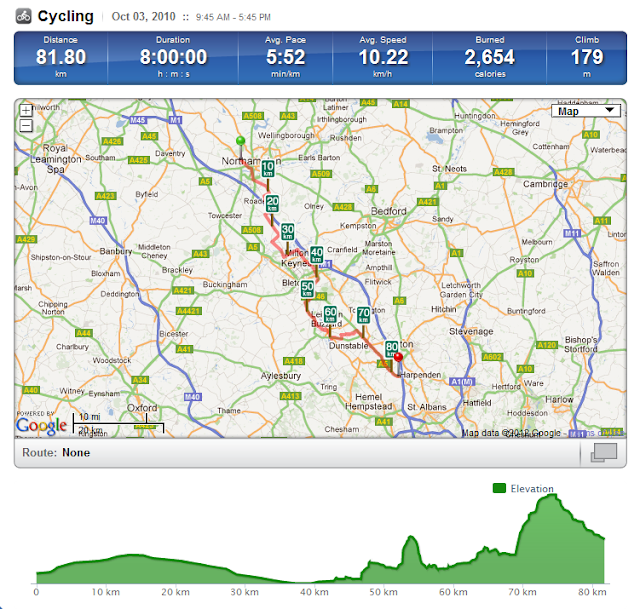 my cycling challenges.... : Day 19 : Northampton to Flamstead, 50 miles, wet and dull! Day 19 : Northampton to Flamstead, 50 miles, wet and dull! Today I was intending to travel from the Hopping Hare in Dunston, on the northern outskirts of Northampton, to Waltham Abbey YHA near the M25 and the Lea Valley. First of all the weather was horrible and towards the end of the day a south-westerly wind was buffeting me about. I did know that the whole of this route was not complete and that my Sustrans route maps refer to some routes opening in 2002! However, I was not expecting quite as many alterations from the maps and missing and confusing signposts. Nene Whitewater Centre is an artificial (pumped) whitewater course just to the south of Northampton.NCN route 6 passes immediately adjacent to the course. According to their website (www.nenewhitewatercentre.co.uk) three pumps control the discharge of water down the 300 metre whitewater course allowing the Centre to control flow rates thereby altering the course’s difficulty and skill Levels required to paddle it. It certainly looked fun and really suitable for the weather! I wished I'd stayed longer watching the fun people were having at the Nene Whitewater Centre because it was after this I managed to find myself misdirected into Hardingstone and then had to find my way out of a new housing estate by a very muddy and slippery grass bridleway totally unsuited to my laden road bike. The Google street view that I have given this link for this might look alright on a dry clear day but it was wet, dark and windy. This was a fairly low point for me!!! The rest of the day was wet and I thought I wouldn't get out the camera very much. Milton Keynes (MK) promised a lot to start with, clear signs (perhaps a little too often) but then rapidly descended into farce as signs had either been moved for fun by locals or otherwise vandalised. I must have spent a good extra hour exploring the canals and paths of MK. The only good thing I can say is at least there were paths, overgrown and infested with tree roots they might have been! Anyway I did manage to get a way out of MK vis Fenny Stratford and the A5(T) and the A4146 towards Leighton Buzzard (LB) for a distance. looking at the map now I have no idea why anyone would ever contemplate going the way I did - especially when I see with the A5 I could have got past LB in half the time. Grrr!! 16.00 in Stanbridge, Bedfordshire. I'm still on route 6 at this point but realise with 33 miles on my current routing to Waltham Abbey I needed a Plan B. I was going at less than 10 mph, in strong wind and then having to navigate through lightly signposted paths around Dunstable, Luton. Welwyn Garden City and Ware I was going to reach the Plan A destination very (too) late! It was at this point that I noticed the A5 was the most direct route if was still going to go to Waltham Abbey or even to get to London. So I I put on extra lights and checked out reflective jacket etc and headed off down the A5. It is fair to say that my view is that trunk roads are to be avoided at all times and especially when cold, wet (with a great deal of spray) and very dull). There was some provision in places for cycling, large warning triangles, but remedial classes for those drivers who are so desperate to get where ever they are going that they have forgotten to look where they are going.